Gamila has a secret. So she puts this secret in our product and sells something so small for £20. The question is, Is it worth it? Actually the question is, what is the secret? But we'll talk about that later. 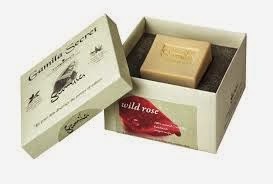 Gamila Secret offers a range of products for different skin types to help neutralize the skin and bring it back to its original state. So if you have ageing skin, you would buy the Rose one and if you have oily skin, you would buy the Lemongrass one (which is what i did). There are different ways of using this product. It can be used all over the body if you want it to. Especially the Rose one which is great for the décolletage. It can also be used by men as a shaving cream. Now, lets get to the good stuff. Does it work? In short, YES. So they recommend you use it for a month straight to see the results but I saw then after a week. I didn't see anything miraculous but I did notice that my skin wasn't as oily. But I was still breaking out, but not as much. I carried on using it and didn't see a great difference after month. I also had to start reviewing another product but I can definitely say that this soap does what it is meant to do and by no doubt will the others disappoint. The secret (in my opinion) is what is not in it. And I'm not talking about chemicals and parabens but the specific part of the herb or fruit that is used to make this product. If you compare it to other natural skincare products, you can see the source of the ingredient but it is is a different part of the fruit/herb that is utilized. Maybe it is more potent, or maybe it is not, but these products are very carefully balances so that not only do they work on the body as individuals but that also work together. I'm not just talking about the skin but also other organs in the body. This is a product I would use over and over again but I'm afraid I have plenty of other products to review. To Buy: Please do. I've recommended it to a lady I know from Germany and she is absolutely in love with it. She buys a new one every few weeks.